We already mentioned the different types of substations. Before more in-depth discussion about each type of substation it is better to know few common essential features of a substation. 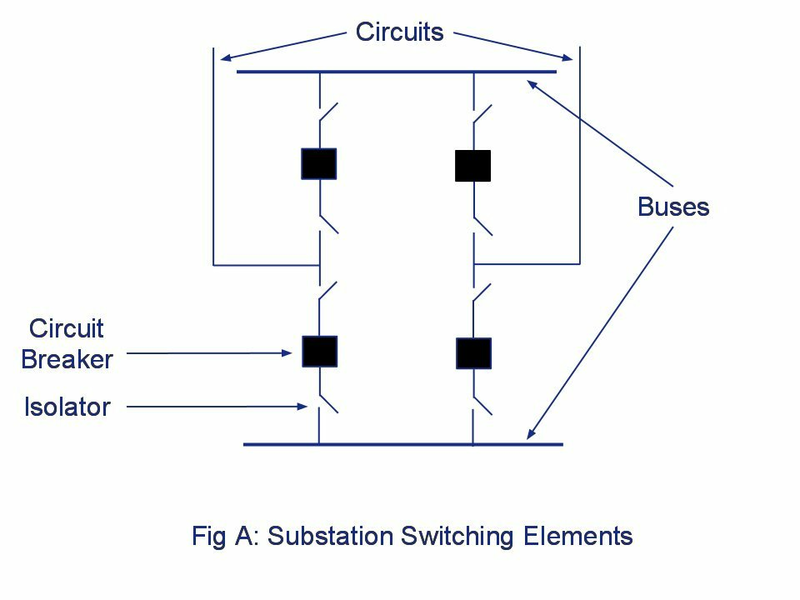 Here we discuss about the bus schemes commonly implemented in an electrical substation. The Bus scheme is the arrangement of overhead bus bar and associated switching equipments in a substation. The operational flexibility and reliability of the substation greatly depends upon the bus scheme. Here I reiterate that the electric substation is a junction point where usually more than two transmission lines terminate. Actually in most of EHV and HV substations more than half a dozen of lines terminate. In many large transmission substations the total numbers of lines terminating exceeds one or two dozens. In this scenario obviously the first requirement is avoidance of total shutdown of the substation for the purpose of maintenance of some equipment(s) or due to fault somewhere. Total shutdown of substation means complete shutdown of all the lines connected to this particular substation. So the switching scheme is adopted depending upon the importance of the substation, reliability requirement, flexibility and future expansion etc.. Of course substation construction and operational cost is also to be considered. Clearly a EHV or UHV transmission substation where large numbers of important lines terminate is extremely important and the substation should be designed to avoid total failure and interruption of minimum numbers of circuits. Before we proceed further I would like to discuss in brief about the Circuit Breaker and Isolator. It will be helpful for novices. See the figure below where two buses are connected by circuit breakers and isolators as shown. A circuit breaker is a device whose main purpose is to break the circuit carrying load current or fault current. 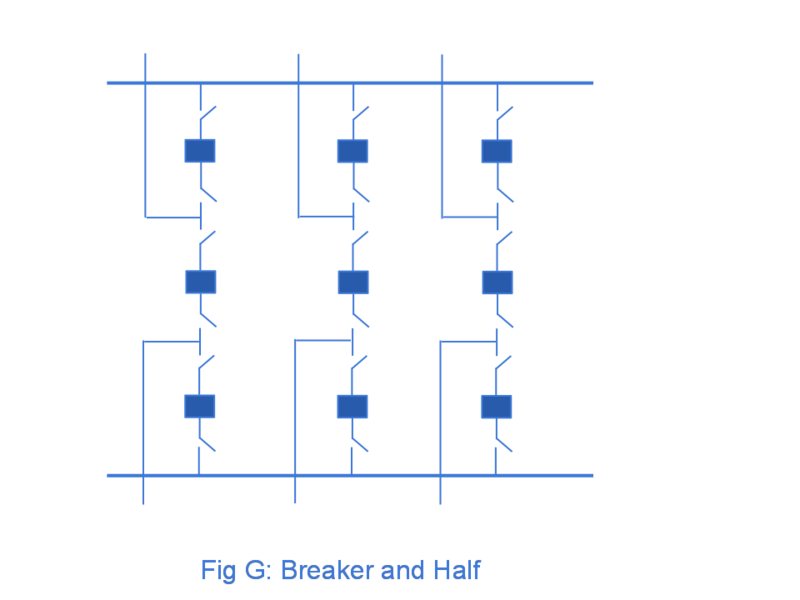 As the breaker is opened then current is interrupted in the circuit. But it is not safe to work with opened breaker as one or both sides of the breaker terminals may be still energised. The breaker is then isolated from the rest of the circuit by opening the isolators on both sides of breaker. The isolators are used to isolate the breaker or circuit. It should be remembered that the isolators are never opened or closed to interrupt or make the circuit. That means when the circuit is to be made on, first the isolators on both sides of a breaker are closed then breaker is closed to allow current flow. When the circuit is to be made off or interrupted, first the breaker is opened(tripped), hence load current is interrupted. Then to isolate the breaker, isolators are opened. Isolators are designed to interrupt small current. Breakers are designed to interrupt large load current and heavy fault current. Both breaker and isolator carry load current in normal state. 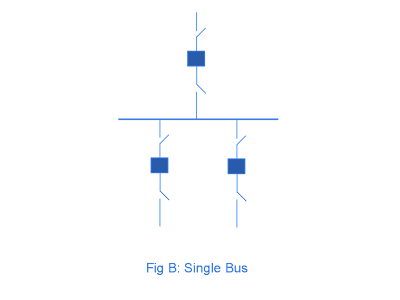 As the name indicate the substation with this configuration has a single bus (Fig-B). All the circuits are connected to this bus. A fault on the bus or between the bus and a breaker results in the outage of the entire bus or substation. Failure of any breaker also results in outage of the entire bus. Maintenance of any circuit breaker requires shutdown of the corresponding circuit/line and maintenance of bus requires complete shutdown of the bus. A bypass switch across the breaker should be used for maintenance of the corresponding breaker. This case the protection system is disabled. 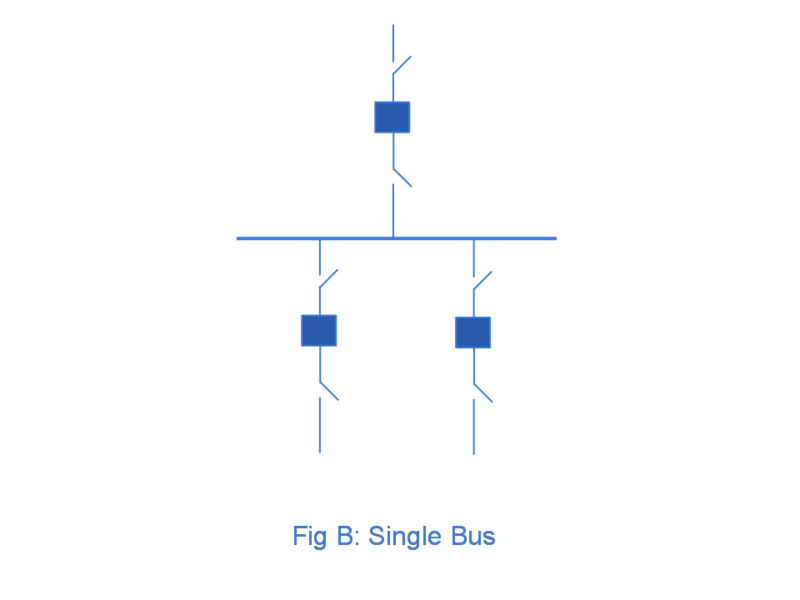 Single Bus configuration is the simplest and least cost of all configurations. The system can be easily expanded. This configuration requires less area. The reliability of this system being low, it is not to be implemented in the substation where high reliability is expected. Large substations usually do not utilize this scheme. By sectionalising of the bus the reliability and availability of the single bus system can be improved. In this scheme one more bus is added. 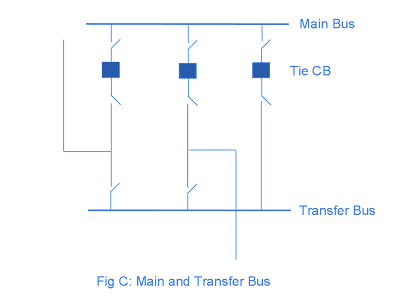 See Figure-C how the equipments are arranged and circuits are connected between main and transfer bus. In this arrangement one more breaker may be used, known as tie circuit breaker. No circuit is associated with this tie breaker. When the tie CB is not present, for maintenance of a circuit breaker, the transfer bus is energized by closing the isolator switches to transfer bus. Then the breaker to undergo maintenance is opened and isolated (opening isolators on both sides of CB) for maintenance. In this arrangement there is no protection for the circuits. The circuits can be protected from outside the substation. 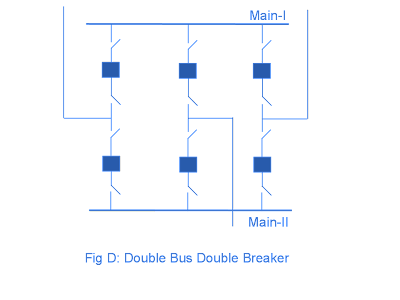 When the tie breaker is present, for maintenance of a breaker the transfer bus is energised by closing the tie breaker. Then the isolator near the transfer bus of the breaker of circuit to be maintained is closed. Now the breaker to be maintained is opened. Then corresponding isolators on both sides of breaker are opened. The breaker is removed for maintenance. The circuit is transferred to transfer bus. Remember that the isolator to the transfer bus corresponding to the breaker not to be maintained remain open. Here the tie breaker protects the circuit in place of removed breaker. In this scheme the relay setting is quite complex due to the requirement of the tie breaker to handle each situation for maintenance of any of the other breakers. This scheme is somewhat more costly than the single bus scheme but is more reliable. The scheme can be easily expanded. The switching procedure is complicated for maintenance of any circuit breaker. Failure of a breaker or fault on the bus results in outage of complete substation. In this scheme there are two buses and two circuit breakers per circuit are used (See Fig-D). In normal state both the buses are energised. Any circuit breaker can be removed for maintenance without interruption of the corresponding circuit. Also the failure of one of the two buses does not interrupt any circuit as all the circuits can be fed from the remaining bus and isolating the failed bus. 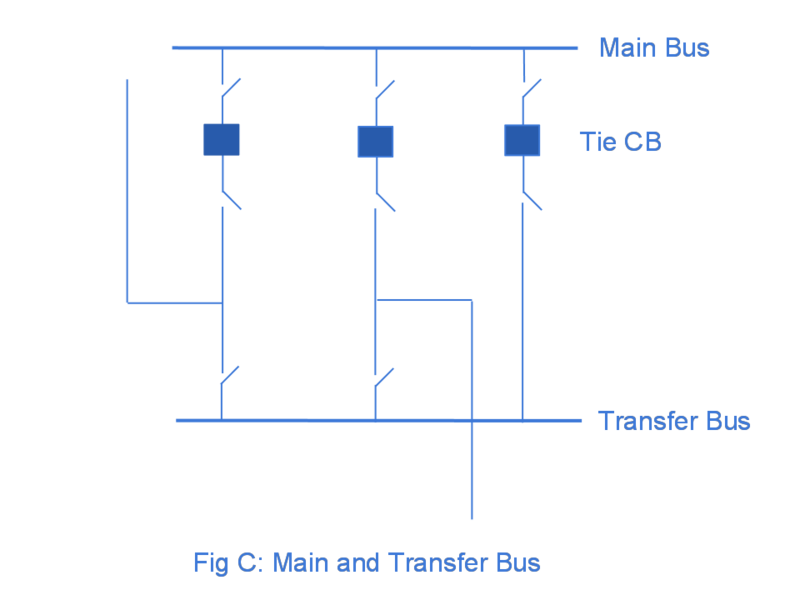 By shifting circuit from one bus to other the loading on the buses can be balanced. The substation with this configuration requires twice as much equipments as single bus scheme. This scheme has high reliability. But due to more equipments this scheme is costly and requires more space. This scheme is usually used at EHV transmission substation or generating station where high reliability is required. This scheme is shown in Fig-E. This scheme has two buses. Each circuit has one breaker and connected to both buses by isolators as shown. There is one tie breaker between two buses. The tie breaker is normally closed. 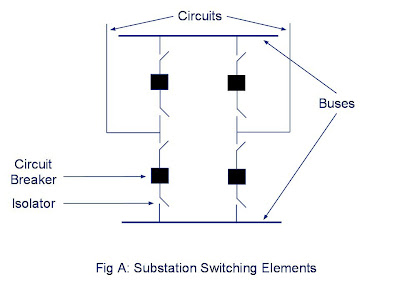 For the tie breaker in closed position the circuit can be connected to either of the buses by closing the corresponding switch. It is clear that fault on one bus requires isolation of the bus and the circuits are fed from the other bus. From the figure you can guess that the configuration has some improvement over the single bus system. This arrangement has more flexibility in operation than the single bus scheme. This scheme is costlier and requires more space than the single bus scheme. Many EHV transmission substations use this scheme with an additional transfer bus. 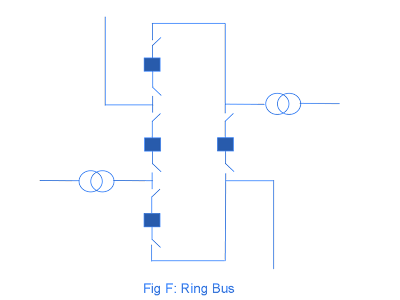 The Ring Bus configuration is shown in Fig-F. The breakers are so connected and forms a ring. There are isolators on both sides of each breaker. Circuits terminate between the breakers. 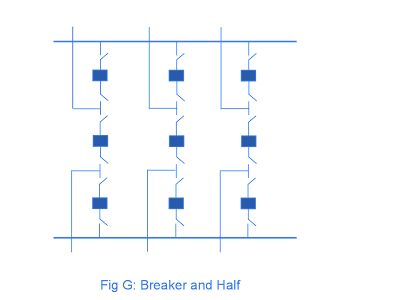 The number of breakers is same as the numbers of circuits. 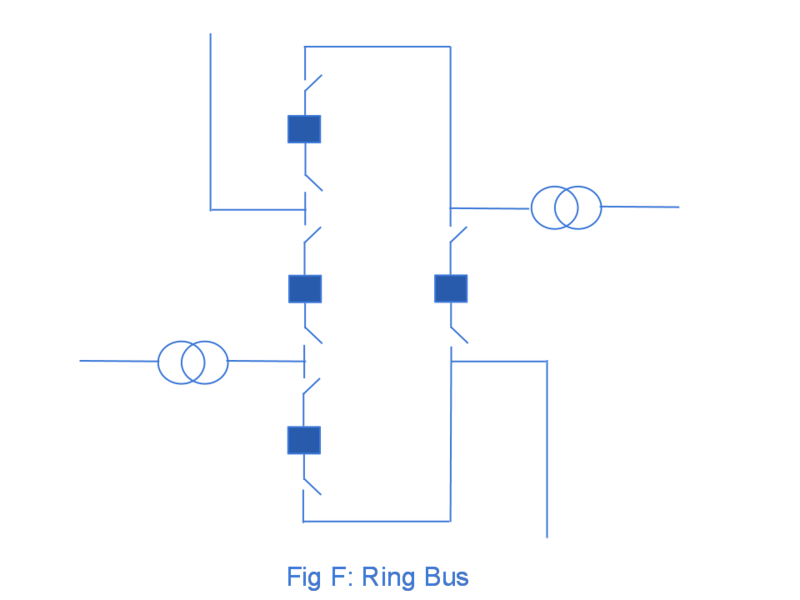 Each of the circuits in ring bus system is fed from both sides. Any of the breaker can be opened and isolated for maintenance without interrupting any of the circuits. A fault on any of the circuit is isolated by tripping of two breakers on both sides of the circuit. By tripping the two breakers only the faulted circuit is isolated and all other circuits continue to operate in open ring state. This scheme has good operational flexibility and high reliability. The main disadvantage is that when a fault happens and the ring is split and may result into two isolated sections. Each of these two sections may not have the proper combination of source and load circuits. To avoid this as far as possible the source and load circuits should be connected side by side (see figure). The ring bus scheme can be expanded to accommodate more circuits. The ring bus scheme is not suitable for more than 6 circuits (although possible). When expansion of the substation is required to accommodate more circuits, the ring bus scheme can be easily expanded to One and Half Breaker(See below and compare) scheme. The scheme is required to be planned properly to avoid difficulties in future expansion. The Breaker and Half scheme has two main buses (Fig G). Both the buses are normally energised. Three breakers are connected between the buses. The circuits are terminated between the breakers as shown. In this bus configuration for two circuits three numbers of breakers are required. Hence it is called one and half scheme. It is something like, for controlling one circuit we require one full and a half breakers. The middle breaker is shared by both the circuits. Like the ring bus scheme here also each circuit is fed from both the buses. Any of the breakers can be opened and removed for maintenance purposes without interrupting supply to any of the circuits. Also one of the two buses can be removed for maintenance without interruption of the service to any of the circuits. If fault happens on a bus it is isolated without interruption of supply to any of the circuits. If the middle circuit breaker fails then the breakers adjacent to the buses are tripped so interrupting both the circuits. 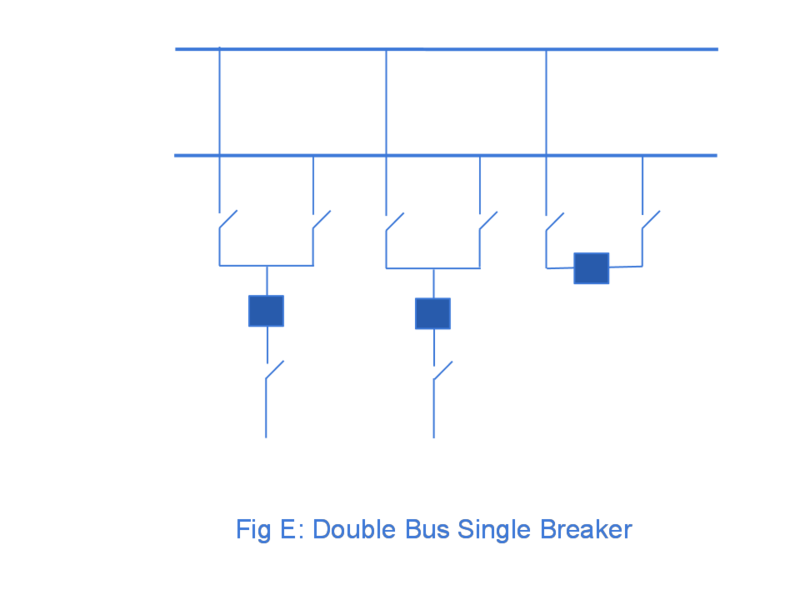 But if a breaker adjacent to the bus fails then the tripping of middle breaker does not interrupt power supply to circuit associated with healthy breaker. Only the circuit associated with failed breaker is interrupted. This configuration is very flexible and highly reliable. The relaying of the scheme is complicated as the middle breaker is associated with both the circuits. This scheme is economical in comparison to Double Bus Double Breaker scheme. This scheme also require more space in comparison to other schemes to accommodate more equipments. Wow! It's the first time I fall on such a great explanation on this topic. I knew I have been around this stuff too long when I started to understand it. Kinda like when I was working in The U.K., I glanced up at a TV in a pub with a cricket match on and I exclaimed "Hey, that was 6 runs!" i couldn't understand the difference between 'main and transfer bus scheme' and 'double bus single breaker scheme'??? Thanks a lot. This is the first time I find a comprehensive and clear explanation on this topic. Thanks for the clear concise explanation. Searching for information on topics related to electric utilities, clear and concise is definately not the norm. Can you please reupload the pictures that are missing since they are vital to understand the concept. Excellent clear descriptions and schematics. I would be interested in seeing the transmission line connections if that did not complicate things too much. Please Different procedure of operation of one and half breaker scheme. Please Explain procedure of one and half breaker operation scheme. 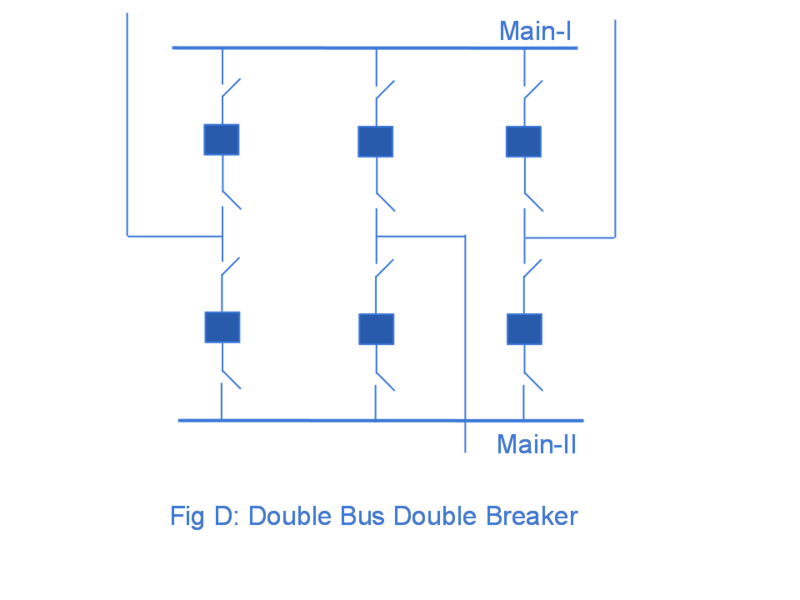 the difference between double bus single breaker and main-transfer appears to be in the use(and rating) of the transfer bus(second bus). 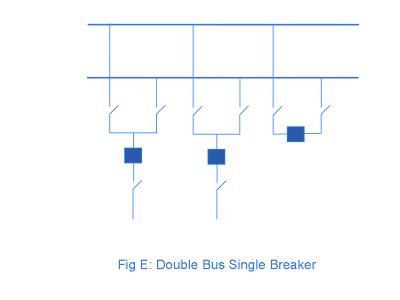 In double bus single breaker the second bus(transfer) is designed to carry full load as the main bus and therefore full rating, whereas the main-transfer scheme envisages only temporary use of transfer(second) bus and therefore a lower rating. However, for two bus single bkr scheme the rating of tie bkr needs to be more if it is to carry whole substation load? ?